Seriously, you are the most stupid heart on Earth. The magnitude of stupidity that you are capable of astounds even me. I thought that FM was the highlight of your stupidity but no, you just had to go and one up that and break yourself all over again. He doesn't like you that way. Deal with it. He doesn't like you and it doesn't mean that there is something wrong with you. Maybe there is, maybe there isn't. The fact is, he doesn't like you and you cannot do anything to change that. Well you can. You can step away and be away from this person. Being around this person is not going to help you in any way whatsoever. He doesn't like you. He cares for you but as a friend. Nothing more, nothing less. Well, possibly less but definitely nothing more. Get over it. I know its hard. It's always been hard for you to move on when you like someone. You need to though. You have to. We have been over this again and again Kenny. You have to. God, you know you have to. Stop hurting yourself over someone who doesn't even know you like him. So please stop. The next time you fall in love, I will kill you. You deserve it. You deserve it because you just never learn do you? You just don't. LOL! Seriously the heart can be deceitful and wishy washy! It is very stressful if your heart and mind are not in the right place. Let your heart break. That's the way it could get stronger. Never be afraid to fall in love and get hurt in the process. When it comes to falling in love our heart controls everything. I love this post of yours. Indeed, emotions overrule what our mind says. Thank you for sharing. 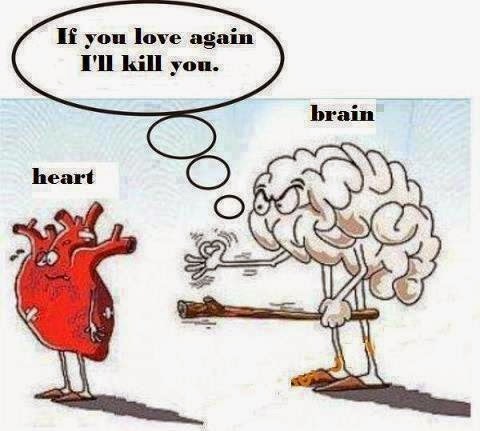 It is why we go for the saying... "The brain was placed above our heart because it knows better." But I believe that it's not which knows better rather, it should be a combination of both. The heart & brain should function and deal/decide with/on things at the same time. They should work together.